So runs Boccaccio’s description of the infectious plague now commonly known as The Black Death, which decimated Europe from its appearance in 1348 until the nineteenth century, and is still found in part of Africa today. When we think of plague today, we might think of the first fourteenth-century outbreaks, or those preceding the Great Fire of London, but it is easy to forget that plague was a regular occurrence in the intermediate years, when efforts were being made to understand and control the spread of infectious disease. One such precaution was the use of quarantine to contain those infected. It has long been thought that the first measures of this kind were introduced in London, by Thomas Wolsey in January 1518, but new evidence suggests that such regulations had been tried before, here at St George’s, just a few months earlier, on 1 November 500 years ago. 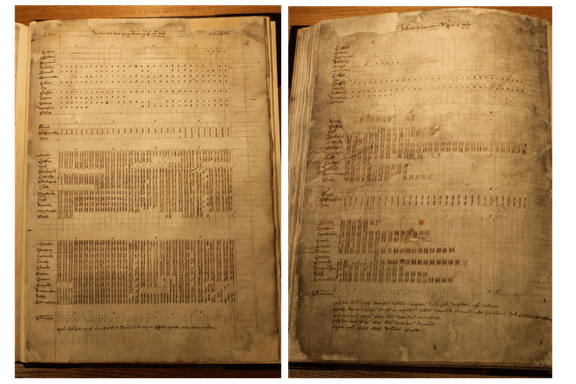 The early-sixteenth century codex known as Denton’s Black Book [SGC IV.B.2] contains copies of two documents concerned with management of the plague, found hidden amongst copies of the college’s various liberties, privileges, grants of land and chantry foundations. The first of these plague documents is a letter written to the college from Henry VIII on 26 September 1517, in which the King complained that Windsor Castle had become ‘grettly infeste w[i]t this contagious plage’, as a consequence of beggars moving around the castle, and an apparent inclination of the castle’s occupants to engage in conversation and share clothing with infected persons. Henry demanded that the Dean and Canons provide a solution to the problem, and asked them to provide regulations to manage infection ‘as ye be your discrete wisedomes shal think most convenient’. This was not the first time that the castle had become infected by outbreaks of the plague. An outbreak in 1479, for example, had proven particularly disruptive, killing three men and driving most of the collegiate community away from Windsor. 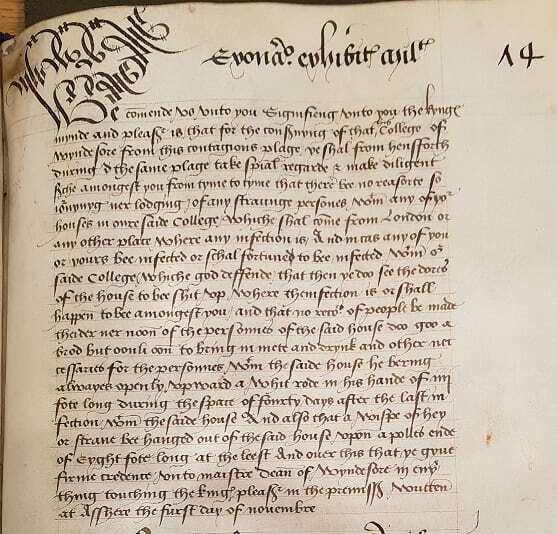 The college’s attendance register entries for April and July 1479 show a huge drop in attendance as plague hit halfway through July. The note on the bottom right records the deaths of three members of the college that month: lay clerk William Brown on the 6th and vicars Richard Merihurst and Richard Arnold on the 14th and 19th respectively. Henry VIII’s mention of beggars is particularly interesting, as it indicates a particular problem at St George’s. By the end of the fifteenth century, the chapel was home to a significant collection of relics – including the bodies of Henry VI and John Schorne – and had become a major site of pilgrimage. Travelling away from their home counties (often in a penitent fashion) pilgrims could easily be confused for beggars, such as one Thomas Clerk from Nottinghamshire who, while travelling on a pilgrimage to visit the body of Henry VI in 1500, was arrested by the mayor and bailiffs of Windsor and locked up as a vagabond without bail for over sixteen weeks! In response to Henry VIII’s letter, the Dean and Canons of St George’s produced a series of ordinances on 1 November to combat the spread of plague within the castle, favouring quarantine measures common in southern Europe for over a century, but never before put into effect at a state level in England. These regulations were probably spear-headed by two prominent canons: the royal physician John Chambre (who became a founding member of the Royal College of Physicians), and the Canon Steward James Denton, who had first-hand experience of equivalent measures used in Paris from his time spent as Royal Almoner to the king’s sister Mary (who was a short-lived Queen of France between October 1514 and January 1515). If an infected individual was identified, their property was to be shut up for 40 days with all occupants inside, except one person who could travel outside to collect meat and drink. In doing so, he was required to carry ‘always openly upward a whit[e] rode in his hande of iiij [four] fote long’, so that he could be easily avoided. The infected property had to advertise contagion by attaching an eight foot pole out of the window with a wisp of hay at the end. These regulations, the first of their kind in England, soon became guidelines for the country. When Wolsey implemented the London regulations, they followed those at Windsor almost entirely, changing only the length of poles to fine-tune the policy. In the absence of supporting evidence, the effectiveness of the college quarantine is difficult to judge. Certainly the regulations did little to appease Henry VIII’s fears; he continued to worry into 1518, as infection spread throughout the country. The measures amounted, however, to a new way of thinking in England, which also spread across the country in the wake of each epidemic, paving the way for new medical responses to the age-old enemy of infectious disease. The initial seeds of this movement began, not in London, but right here in Windsor. Stories of Boccaccio (The Decameron), ed. John Payne (1903), p. 6. The year 1517 has been established as a likely date from internal evidence. 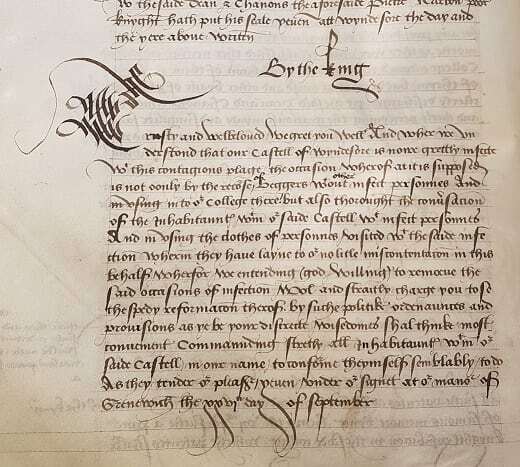 Crucially the language of the documents indicates that they must pre-date the London regulations of 1518.